Some tips to make your first week a bit easier. The first few weeks after having a baby can pass by in a whirlwind of nappies, visitors and sleepless nights. You’re adjusting to living with a tiny, noisy roommate who doesn’t seem to know night from day and who doesn’t speak your language. 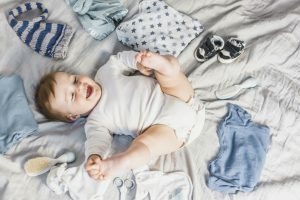 If you’re an expat in Madrid, things can be even more difficult without family support, so here are some tips to help get you through the fourth trimester without losing your sanity. 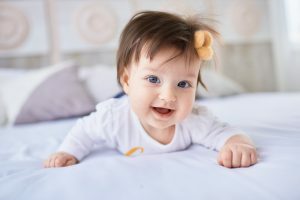 Instead of stressing about time and routines, in the early weeks, let your baby decide when it’s time to feed and sleep, and just go with it. A lot of people like routine from the beginning, but remember that your baby doesn’t wear a watch! Every baby is going to be different, so at the beginning it’s easier to adapt your life to their schedule. Ok, first of all, you’re not “doing nothing”- you’re keeping a tiny human being alive. That’s quite a feat! It’s difficult to just sit down when you feel like you should be doing things, but I had to learn to do it. The weeks fly by so quickly that you’ll regret not spending more time cuddling your tiny baby instead of mopping the floor. Don’t be in a rush to jump up once they’re asleep either, those night feeds are going to take their toll on you, so make sure to get some sleep when your baby is sleeping too. If you’d prefer to stay at home when people come to visit the baby, take them up on their offer of help. Whether it’s asking them to bring over a lunchbox of food, or even a coffee, it gives you a break. During the first few weeks I hated staying at home so I used visitors as an excuse to get out for a bite to eat. It’s also a great way to keep visits shorter if you’re tired, whereas when someone visits at home it can be harder to ask them to leave. Shopping centres in Madrid are a fantastic place to meet people with a small baby as they’ve generally got a feeding room and changing tables, as well as air conditioning and plenty of places to sit down and take it easy. Plus, the constant buzz of activity acts as white noise to help settle your baby to sleep. Whether you’re planning on setting up camp with baby on the sofa or in your bedroom, set up a table with everything you need to hand: remote control, bottle of water, snacks, a book, your phone, phone charger, a spare muslin. It means you won’t need to grab something as soon as your little one has fallen asleep on you! I also made sure to bring a bottle of water and snacks in the changing bag to help stave off crazy hunger pangs. If you haven’t got a car, getting from A to B in Madrid with a newborn baby can be quite a challenge. The metro is fantastic, but a lot of stations don’t have elevators (here’s a list of the ones that do) or escalators and trying to carry a baby and a pram up the stairs is not something you want to attempt just after giving birth! The buses are easier but most of them only allow one or two prams, so you may find yourself waiting at a bus-stop until one with an empty space arrives. I found that baby-wearing with a sling or a carrier made things much easier as we weren’t limited by where we could go with the pram. Here you can see some great places to go with your baby in Madrid if you’re getting out and about. A lot of health centres (centros de salud) run free post-partum classes for new mums in Madrid. 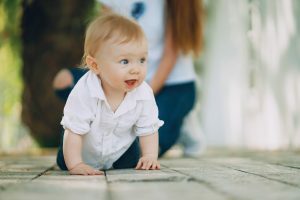 In Vallecas, for example, they run a weekly meet-up where they cover things like baby yoga, breastfeeding support, baby wearing, pelvic floor exercises, craniosacral therapy and baby massage. It’s a great way to meet other mums in Madrid, and it’s a wonderful excuse to get out of the house. Have you got any other tips for the first weeks with your little one? 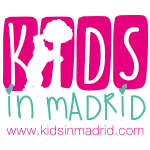 Leave them in the comments section and check our blogs for more content related to mothers in Madrid!